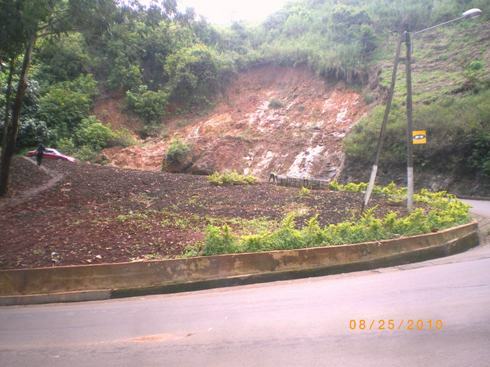 In August 2009, landslides occurred on the Bamenda escarpment (North West Region of Cameroon) and blocked the road at C-Bend, Station Hill and a bridge collapsed at Akum. This led to total frustration as transportation was hindered for days. This drew the attention of Geo–Environmental and Ecological Researchers to this region popularly referred to as the “Grassfields” of Cameroon. It was not the first time the event occurred in this region. Less environmental sensitization has been carried out in the region as the inhabitants are still ignorant about landslides and related geo–environmental and ecological problems. In addition, less research has been carried out in this area. In 2010, two female research students from the University of Yaounde 1 started carrying out geo–environmental research in the Bamenda urban area on landslides in the uplands (escarpment) and floods in the lowlands (flood plain) to complete their Master of Sciences cycle. These two aspiring female geoscientists faced a lot of problems from the acquisition of field materials (maps, GPS, geological hammer, clinometers, compass…………) and past work carried out in this region. As such, they spent much time looking for these resources. One of them succeeded to get a GPS (Global Positioning System) from the Bamenda Urban Council, but it was not a good one for geosciences field work. Due to the above difficulties, GERC (Geo-Environmental Resource Center) Cameroon was brought up in 2011 by a team of Geosciences Research Students from the University of Yaounde 1 – Cameroon, headed by Ndzishepngong Kelvin Ngwang, as a tool to build the capacities of young Geo–Environmental and ecological researchers, facilitate and professionalize Geo–Environmental and ecological research and to create more environmental awareness in Cameroon. During the declaration process at the Divisional Office in Kumba, South West Region of Cameroon; and after a careful scrutiny of the submitted file, some objectives were screened out while the acronym GERC was changed to GERAS (Geo-Environmental Resource Association) to suit association norms. GERAS was declared by the Cameroon Government on the 8th of January 2013 in accordance with Law Number 90/053 of 19th December 1990 governing the Freedom of Associations in Cameroon. GERAS’ Registration Number is G39/D14/5/75. You are welcomed to be a long term partner of GERAS CAMEROON if we share similar visions, values and approaches. Contact Us today!!!!!!!! !